We always try to update our followers on any Instagram updates or news. This post was updated on August 7th, 2013. You can find our previous update on a new Instagram sharing functionality below. 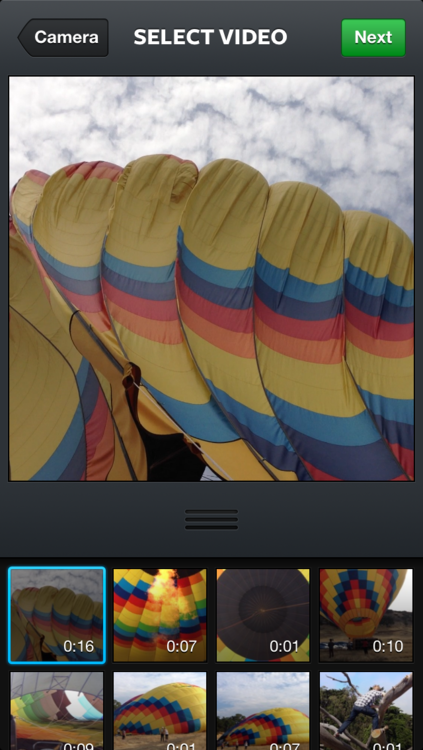 As shown, you can now select videos from your phone’s media library to bring into Instagram. Image courtesy of Instagram. Instagram has updated its video functionality again with a feature that many users have been longing for: the ability to import videos into Instagram from your media library. About a month after Video on Instagram was introduced (and was quickly adopted by brands), the app developers have introduced a series of features largely based on the requests of users. The ability to import videos from your phone’s media library is the biggest change, and one that has serious implications for video creators. Previously a user needed to open Instagram, click the create button, click the video icon and then begin filming. The delayed process meant you couldn’t capture something on the spur of a moment. The app also limited how long you could film (to the 15-second max of an Instagram video) which forced you to use whatever you got, instead of allowing you to capture and share that perfect moment. No longer. Users can now film lengthy videos using their phone’s camera, import them into Instagram, and trim them down to share only the best parts of the videos. This is a great change for brands, who usually have more strict quality requirements. Other updates include the ability to square-crop videos and the introduction of Video on Instagram for users of Android 4.0 (Ice Cream Sandwich). In the ongoing battle of Vine vs. Instagram, the latter may have just gained a leg up. Have you ever tried to share Instagram videos or photos online? It used to be a fairly difficult procedure. Third party tools popped up to help in the process, but it involved a lot of leg work to take Instagram photos and videos and embed them online. Thankfully, this should no longer be an issue. The company has announced a new web embedding feature that will make it simple and easy to share Instagram videos and photos (like we did with this image!). The new tool has been inserted seamlessly into Instagram’s online profile pages. When viewing an account on your desktop browser, click on the photo or video that you want to share and you’ll see a newly added share icon on the right hand side of the photo, directly underneath the comment button. Clicking that button brings up an embed code, which you can paste into a blog post or website. That’s all there is to it. This embedding feature is a great addition for individuals or brands that want to utilize and share Instagram videos and photos as a part of their content strategies. The embed code keeps the formatting of the original photo or video, meaning the the content will always be attributed to its source. This allows brands to both easily acknowledge and share the contributions of their fans and followers. So, will you be taking advantage of this new feature? 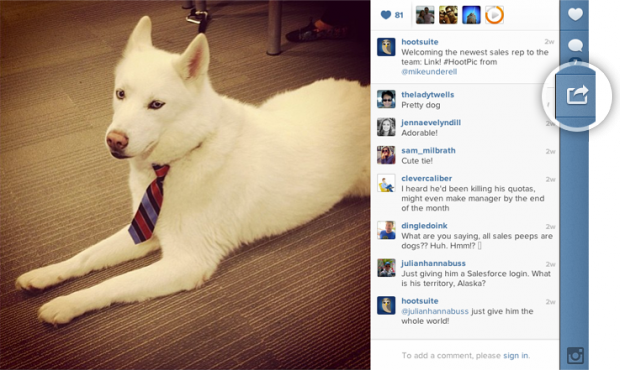 Learn how to add Instagram to HootSuite.